AAA, faceted, aqua fire, bezel-set, rainbow moonstone and AAAA, faceted, aqua blue flash, labradorite and sterling silver pendant necklace. A beautifully faceted, semi-translucent, AAA, rainbow moonstone gem is set in a sterling silver bezel, and it glows with bright aqua fire as it catches the light. Wrapped with sterling silver wire below the bezel-set gem are a microfaceted, AAAA, rainbow moonstone rondelle that flashes with aqua fire and a beautifully faceted, AAAA, labradorite teardrop that flashes with vibrant aqua blue from several different angles as it catches the light. The back of the bezel-set gem is flat, and the pendant is not reversible. Like all the labradorite and rainbow moonstone jewelry in my Etsy shop, these are natural and untreated gemstones. Now with FREE shipping for U.S. orders and lower priced shipping elsewhere! What you see is what you get. If you purchase this necklace, you will receive the exact same one that is shown in the photographs. The bezel-set rainbow moonstone is 14mm x 13mm x 5mm (9/16" x 1/2" x 3/16"), not including the rings soldered to the bezel, and the rainbow moonstone rondelle is 4mm. The labradorite teardrop measures 18mm x 13mm x 4mm (3/4" x 1/2" x 3/16"). The three-gemstone pendant is suspended from a sterling silver ring, and it dangles 50mm (2") from a sterling silver chain that fastens with a sterling silver lobster claw clasp. The necklace is shown with a 17" chain in the photographs. This eye-catching labradorite and rainbow moonstone pendant necklace flashes and glows with beautiful and bright aqua blue! Labradorite seems almost magical. When it catches the light, it can shift from subtle silvery gray or gray green to iridescent brilliance. The bright color flashes make it fascinating to watch. Please remember that every labradorite gem flashes its colors as it reflects light, so it can look very different at different angles and in different lighting conditions. In low light, it may appear mostly gray. 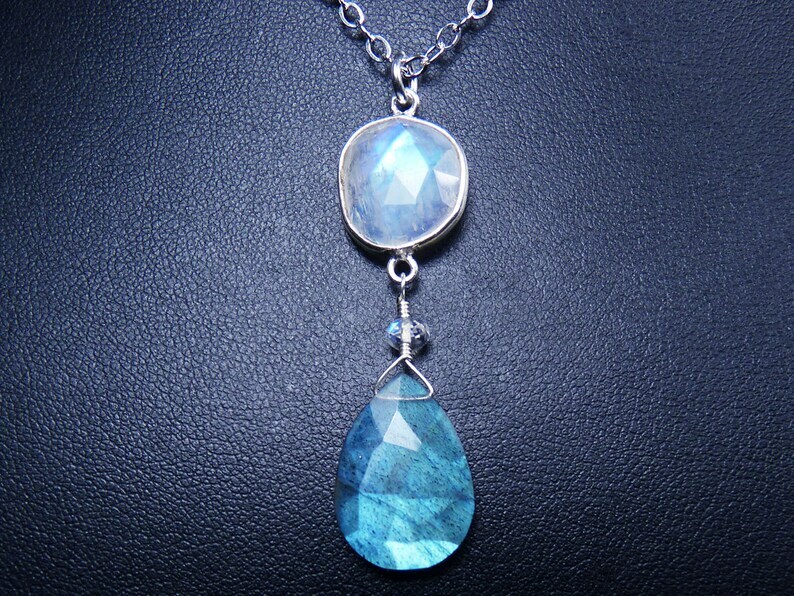 See RazzleBedazzle's FABULOUS labradorite jewelry collection! See all of RazzleBedazzle's rainbow moonstone jewelry! All RazzleBedazzle necklaces are packaged in gift boxes, perfect for gift giving. Beautiful stones and quick delivery. Will purchase from this shop again! Thank you for the beautiful earrings! So carefully and thoughtfully packaged. Highly recommended! Well made, super fast delivery, loving the colors. I’ll be back for more. Fast shipping and the item I received was exactly what was advertised. RazzleBedazzle accepts Paypal and credit cards. Payment should be made when you complete the checkout process. If I have not received payment within three days, the transaction will be canceled and the item relisted. Sales tax will be charged on items shipped to California addresses. I hope that you will be thrilled with your RazzleBedazzle purchase. If you are not completely satisfied, however, you may return any item within seven days of receipt. A returned item must be unworn, in its original condition, and be returned with its gift box or pouch. A refund will be issued once the item is received by RazzleBedazzle. Shipping charges will not be refunded, and return shipping is the responsibility of the purchaser. A returned item must be shipped in a well-sealed box and insured. Please contact me if you would like to exchange RazzleBedazzle jewelry that you received as a gift. Worldwide, with the exceptions listed below. All items shipped via USPS first class mail. Items shipped within the United States include delivery confirmation. Purchases will be mailed within two days after payment is received. Items paid for on Friday will be mailed on Monday or Tuesday. If you need an item sooner, please contact me about expedited shipping options and costs. Shipping within the United States is free. Shipping to Canada is $5.95USD for the first item and $1.00USD for additional items in the same order. International shipping is $9.95USD for the first item and $1.00USD for additional items in the same order. Orders to Italy and Russia will only be shipped Insured Priority Mail. Please contact me to make a reserved listing that will include the correct shipping costs for these countries. Orders will not be accepted for Mexico, Indonesia, the Philippines, the United Arab Emirates, Saudi Arabia, Mainland China, India, and any countries in Africa, South America, Central America, and the Carribean. Orders will also not be accepted for countries in the Middle East, with the exception of Israel. Any customs fees charged by the buyer's country are the responsibility of the customer. Unless an item is listed as one-of-a-kind, I can often make custom versions or additional similar items. Please contact me with any questions or requests.